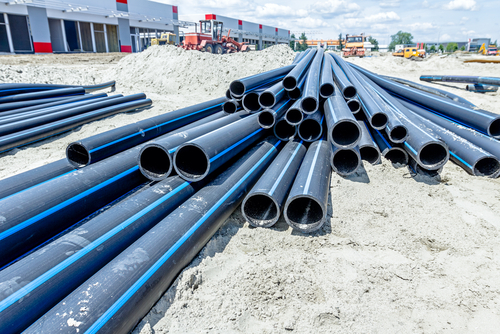 Today, polyethylene pipe is a robust, highly reliable solution utilized in a multitude of applications. Have you ever wondered how the pipe came to be? Let’s delve a little into its history. It was in March of 1933 that a pair of organic chemists collaborated on what would eventually become polyethylene. The two were testing a variety of chemicals when, upon testing a white, waxy substance, they would go on to create polyethylene. The white substance emerged when the chemists were evaluating how benzaldehyde and ethylene would react to each other. The container the pair utilized for testing purposes ended up springing a leak, causing all of the pressure in it to escape. The white substance resulted in something strongly resembling plastic. By the late 1930s, the material had been patented and put to practical use. It was in the 1950s that polyethylene evolved into what we know today as high-density polyethylene, (better known its HDPE acronym) thanks to German chemist Karl Ziegler. By the mid-1950s HDPE was being produced as pipe. Ziegler’s pioneering efforts earned him the 1963 Nobel Prize in Chemistry.